Popping up to say hello! My family is getting ready to leave for a spring-breaky-beachy-no-wifi-vacation. woot! These liquid-paper-white legs need some sun. I do have some exciting things happening while I'm gone, and while I won't be able to interact with you on Instagram or Facebook, I did pre-schedule a few posts. 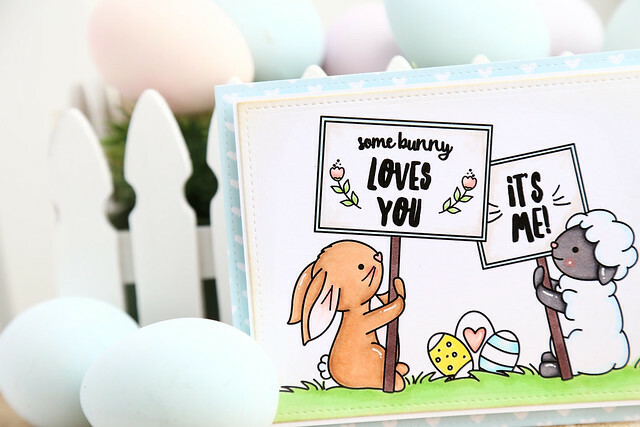 Before I go, the Lawn Fawn team is collaborating with Little Things from Lucy's Cards to create fun shaker cards all this week! I made a Rooting For You shaker card. 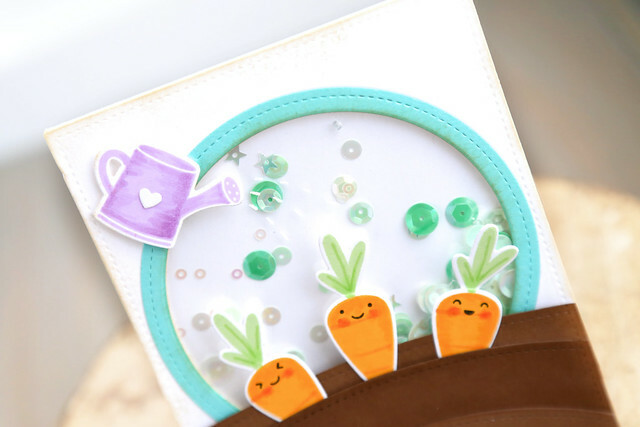 I wanted to make it look like the peppermint sequin mix is the water, falling onto the growing carrots. The sentiment is from an older set, Love 'n Breakfast, but I thought it worked really well here! Hi there! Welcome to my first-ever blog hop as part of the Avery Elle team! 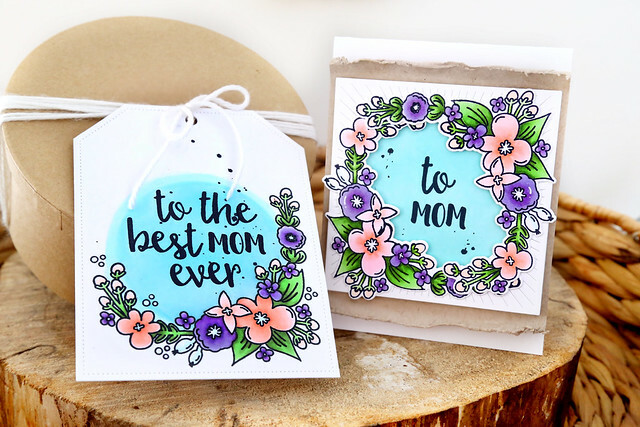 I created a card and tag set, just for mom. I like that this means I am ahead of the mother's day game! My 10 year old daughter asked if she could have them to give to me, haha. 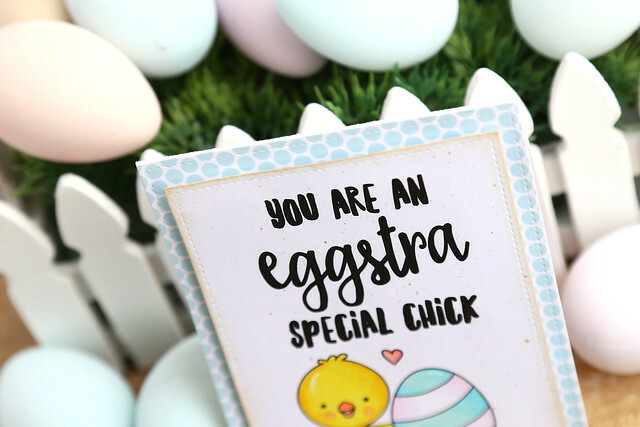 I used the same set to create the greeting on my tag (which is giant-sized, and new to AE,) as well as a floral garland. Here, I rubbed blue ink in a circular motion to mimic the look of the card. I finished off both the tag and card with a bit of black ink splatter. To celebrate our Spring 2016 Release Blog Hop, Avery Elle is giving away a $25 Gift Certificate to one random winner. To enter to win just comment on this post. There is no purchase necessary and you must be 18 years of age or older to enter. This giveaway is void where prohibited. You can also do options 2, 3, 4, 5 or all 6 of the following to increase your chances of winning. You have until midnight Sunday, February 28th to enter. The winner will be announced on the Avery Elle Blog on Monday, February 29th . All products are available for purchase in the Avery Elle store right now. 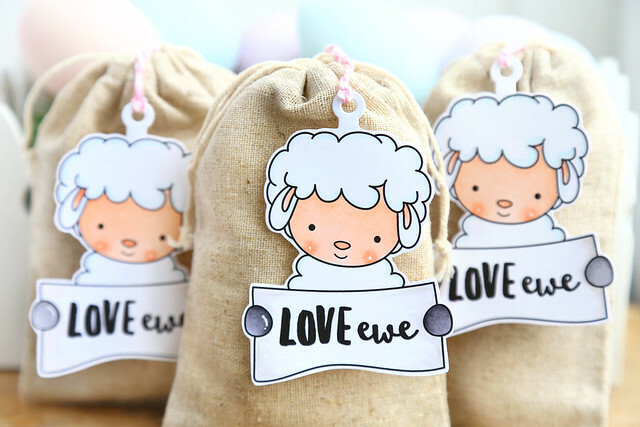 On this last day of the Easter Collection digital stamp highlight, I have a little lamb to show you. I printed out the full image 3x, colored them, and turned them into hanging tags. I have a die from Clear and Simple Stamps that cuts out the top of a tag (I'm sorry, I tried to find a link in their store, but I couldn't!) and then hand-cut the rest of the lambs. 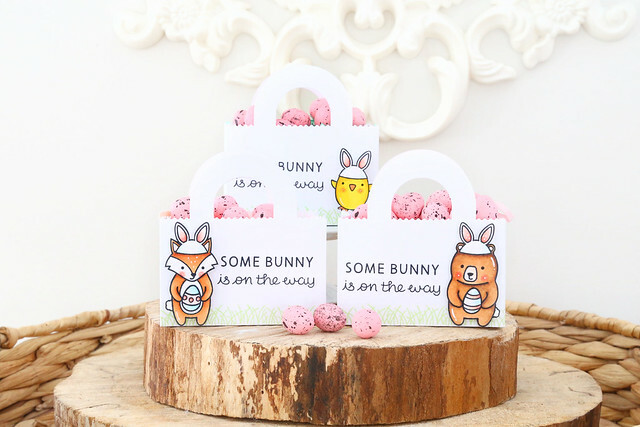 I can't wait to put these treat bags into my kids Easter baskets! I'm thinking of also making placecards for all the kids at our big Easter dinner using this image. I provide the image without the greeting in the banner - all you'd have to do is stamp or type in the names and done! GIVEAWAY: check me out on instagram! 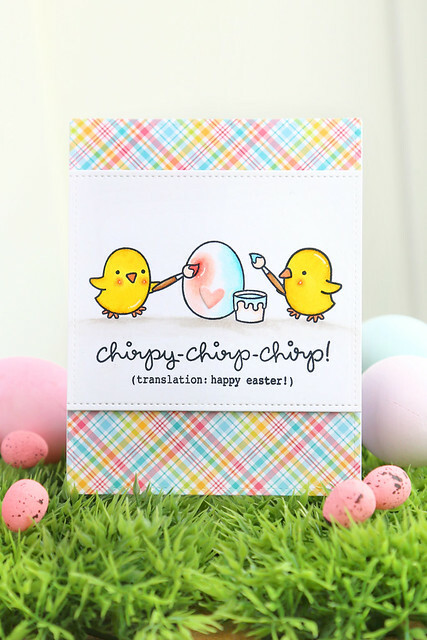 It's the last day to enter giveaways for my digital stamps. I'll be announcing all the winner tomorrow. 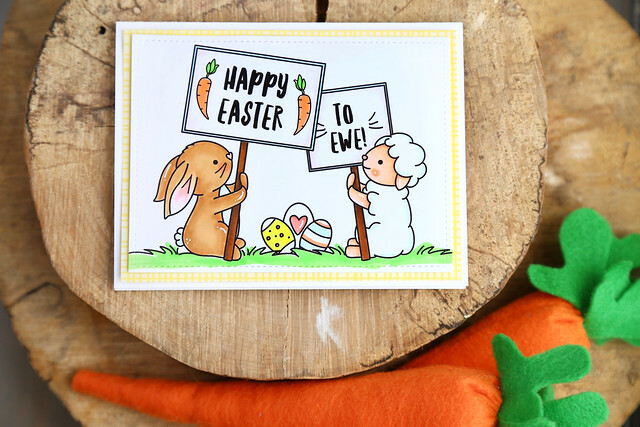 We're a few days into looking at the Easter Collection of digital stamps in my etsy shop. I titled this one.... Easter bunny. I know, super lame. I have problems when it comes to naming my images. I hope you'll still think he's cute! I printed the bunny (he comes holding a flower - I wanted to do something different than the regular carrot! 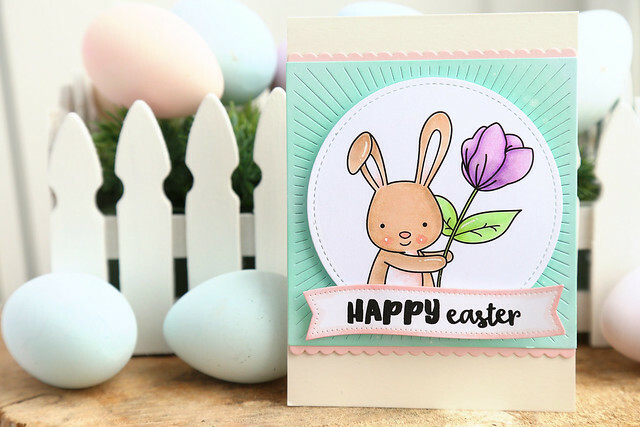 I figure this way he could be used for more than just Easter cards) and die-cut him using a 2.5 inch circle die. Once colored, I mounted him onto my favorite die ever, the burst die from Avery Elle. It just frames an image so well! 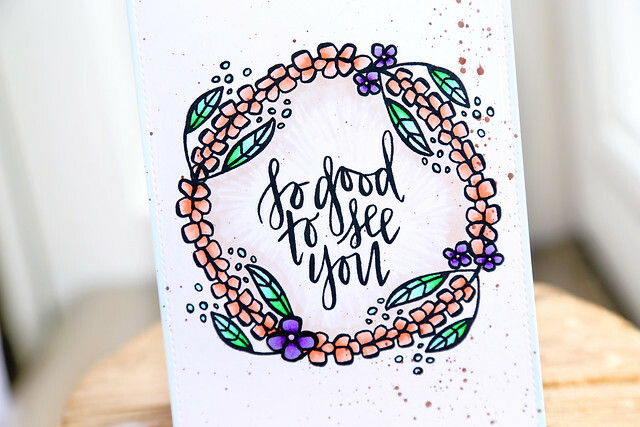 I also die-cut the sentiment onto an Avery Elle wavy banner die - from their upcoming new release! I colored the outline pink to have it match the scalloped borders. 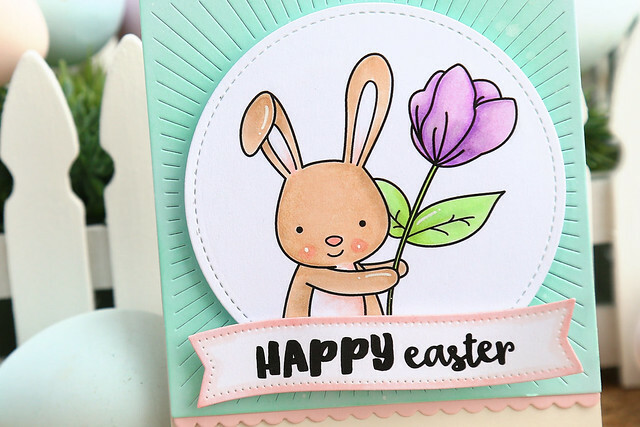 I just love crafting in these pastel springtime colors! It makes me so happy. In case you missed yesterday's post, click over and scroll down to see a picture of the entire bunny. I kind of cut his legs off for this card. hee. GIVEAWAY: I'm running giveaways all week! 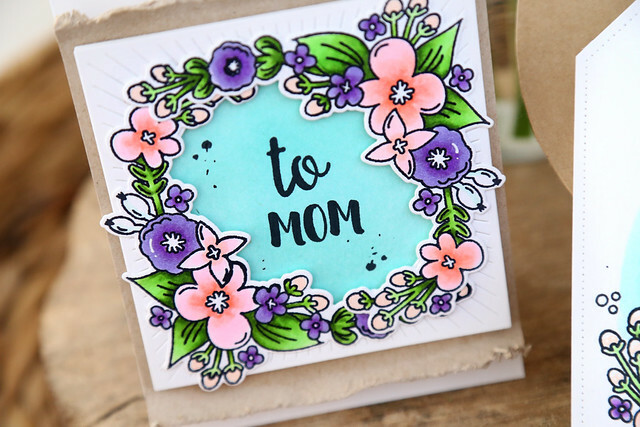 The winners will be announced on Friday, so head over to instagram and comment on one of the contest pictures for a chance to win some digital stamp sets. 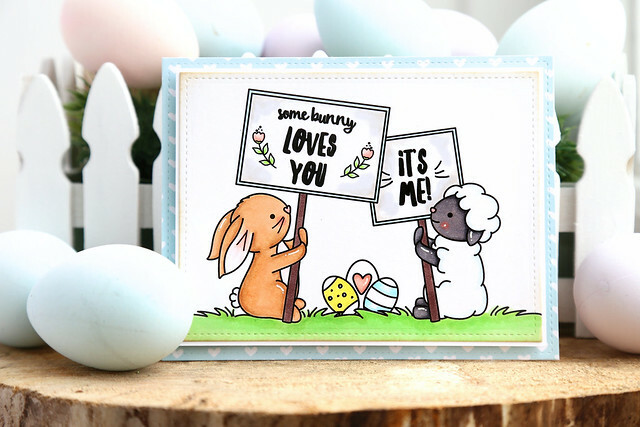 I'm showing off the new Easter digital stamp collection, available in my etsy shop: just ME digital stamps. I just love his huge head! I have him with his arm draped over a striped Easter egg. I used Y02 and Y18 to color his body, and YR02 for his beak and feet. Digital stamps are so great because you can manipulate them. 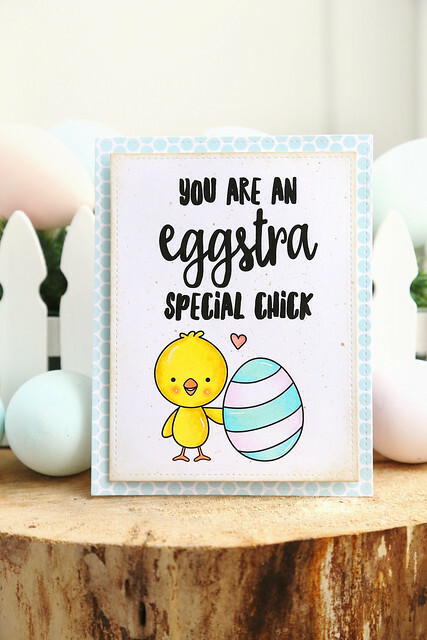 If you didn't want the entire sentiment, you could always remove "eggstra" and the "n" from "an" to have a simpler "you are a special chick" greeting. Or how about for a springtime birthday? Eggstra! Eggstra! Also included in this digital stamp set is a chick with his arms down. He is so cute with his arm draped around the egg, but this way you could mix and match him with other sets more easily. Here is the chick sans egg, snuggled in with the adorable bunny I will spotlight tomorrow. I hope you like him! Hop on over to instagram, I'm doing a separate giveaway every day. I'll be highlighting the different images this week, and running some giveaways. First up, my favorite of the series: Easter Signs. I'm trying something a little different this time, with these images. I've created more of a full set for you, with many different mixing and matching options. 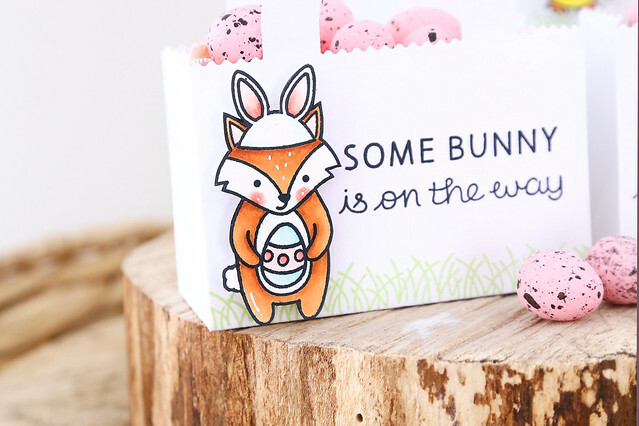 With Easter Signs, you'll get the entire scene fully assembled, as well as each element separately and different sentiment options for inside the signs. I can see myself using the little bunny image alone, with his blank sign, to personalize an Easter tag for one of my kids. I've also included the sheep alone, and the sentiments separately. 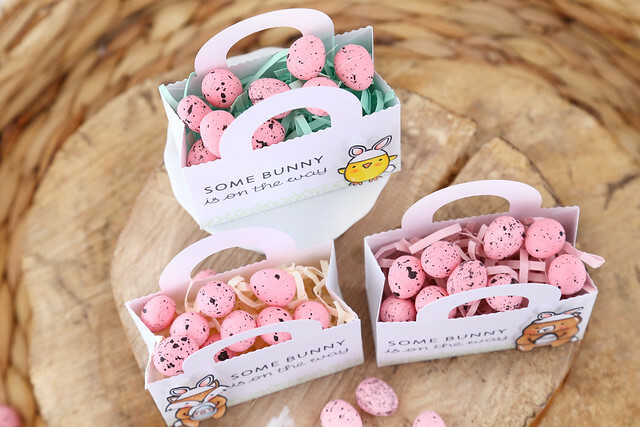 I've even blown up and included the little carrot and flower images that you see in the bunny's signs, as well as the trio of Easter eggs. There is also a third sentiment option, and it's so cute! I'll be sure to share a colored version soon! 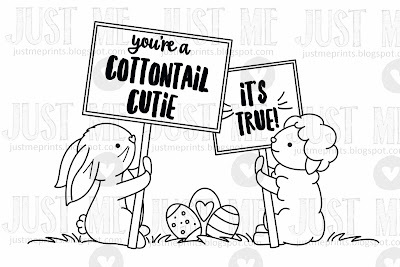 I hope you like Easter Signs! For a chance to win it for yourself, visit me on instagram. But before you go, tell me how you like your lamb colored? In darker grey like on the first card, or soft fleshy pink like in the second? I'll color my next lamb however you choose. This is my second post of the day! 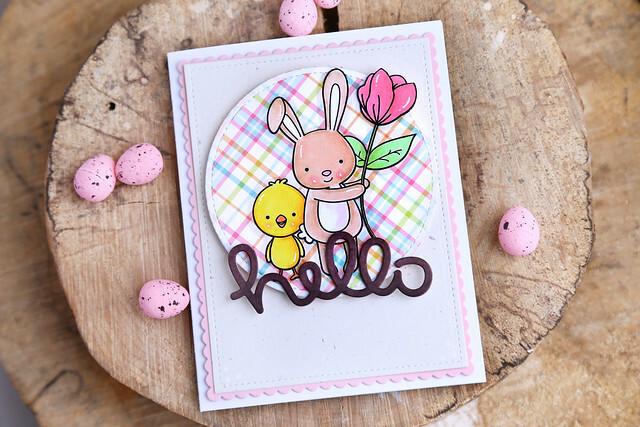 To see the card I created for Neat and Tangled, click *here* or scroll down. 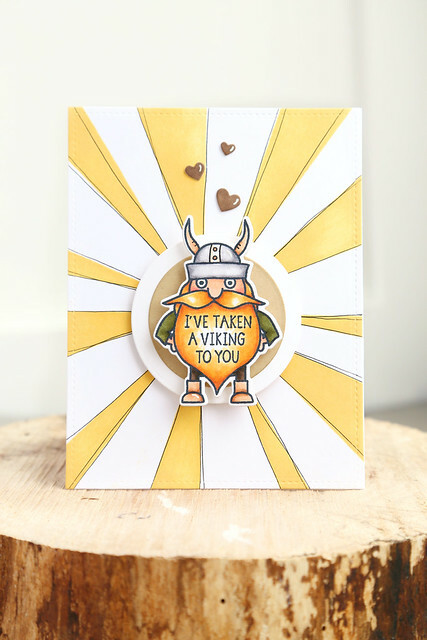 I stamped, colored and die-cut the viking. I used a copic multiliner pen to add a few extra details to his viking hat. Then, I propped him up onto 2 nesting circle die-cuts. For the background, I used a sunburst stencil with yellow ink, and then messily traced the rays to give them a more cartoon-y feel. 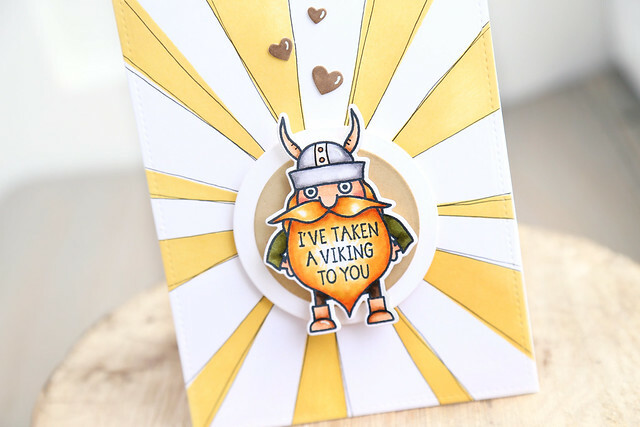 The trio of hearts above the viking are from the geek love ellements set. I stamped the large sprig 4 times, to form a wreath. I did this without doing any masking whatsoever. If you look closely, you can see an overlap in the upper left quadrant, but it didn't bother me. The stroke of the stamp set is wide, whimsical, and very forgiving. You gotta love that! There was a more obvious overlap, at the bottom left, but I stamped a large flower separately, cut it out, and stuck it to hide the stamped seams. And just so that one large flower wouldn't look out of place, I stamped a few smaller ones around the wreath, to bulk up where the other stamped images lined up. 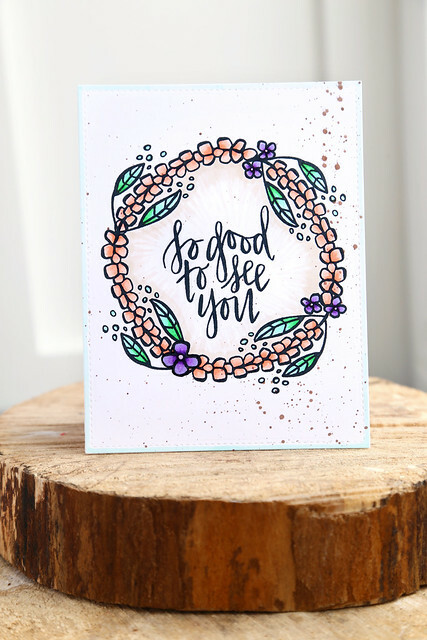 Once the wreath was colored, I used a light, neutral colored marker (E40) to flick color in towards the sentiment. It has a sort of sunburst effect that highlights the sentiments even more. Hi there, and welcome back to another day of Lawn Fawn's February inspiration week. 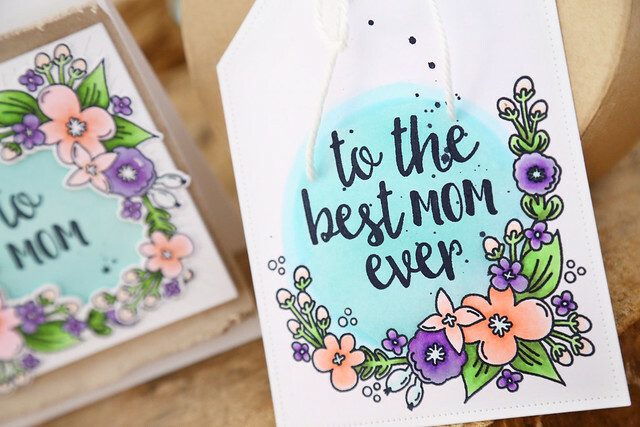 Today, we're showing off the adorable Mom + Me set, perfect for sending love to your mama, or your grandmama. 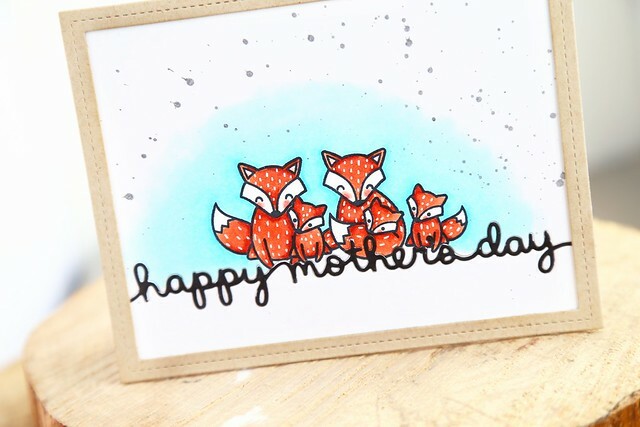 I decided to stamp out an entire foxy family. I stamped all but the daddy at first, because I had to mask the little one to the left so that the daddy could snuggle in there. I was too lazy to mask everything, so instead of sponging on the blue ink, I colored it with copics. The trick is to feather everything out with the colorless blender. I added some ink flecks to fill the space, and framed out the card with our stitched Rectangle Frame. 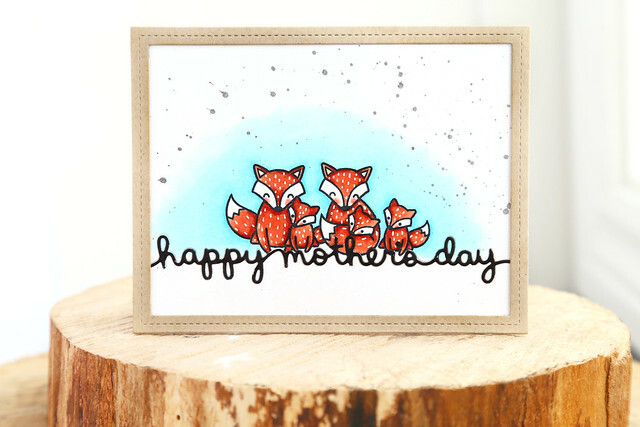 The new Happy Mother's Day border die is so perfect, I added it to ground the images. It's another day of Lawn Fawn inspiration, and we're showing off the new plaid papers. 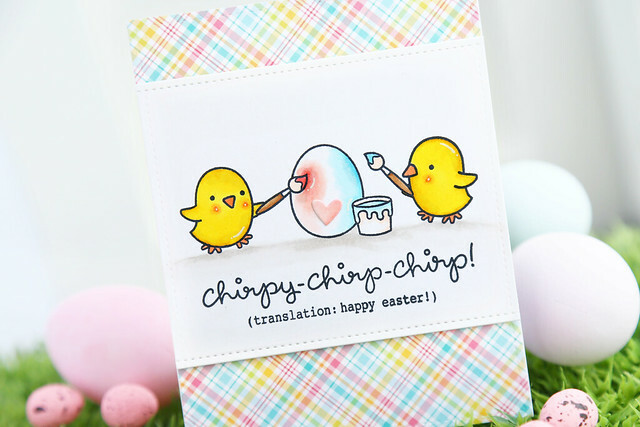 I couldn't help but pair the plaid with Chirpy Chirp Chirp, and have the little chicks paint the egg. The plaid paper picks up on every single color I've used in the scene. The egg painting feels a little Sleeping-Beauty-ish, doesn't it? Blue! Pink! Blue! Pink! Also, is it weird to have chicks painting an egg? I'm wondering if they have a little brother or sister in there! Maybe they just want to make it nice for the new little one? In any case, I stamped the paint brushes, masked them, and stamped the chicks in place. Without removing the masks, I stamped the little paint bucket, masked it as well and then stamped the egg so it looks like it sits in behind. I colored everything with copic markers. I have gotten a few emails asking which yellow markers I use and how I make sure it doesn't bleed. It's true, yellow is a trickier color to work with, so go slowly and don't try to blend it all out without letting the paper rest in between layers. I used Y02 and Y17 here. That's it! Hi there, and welcome back to another day of Lawn Fawn's February inspiration week. 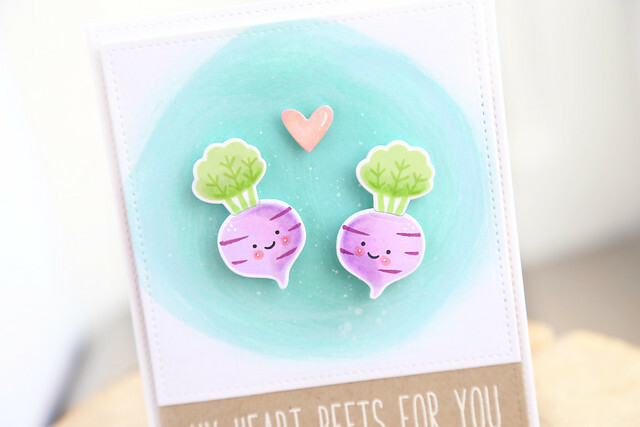 Today, we're showing off the adorable vegetable-themed set, Rooting for You. 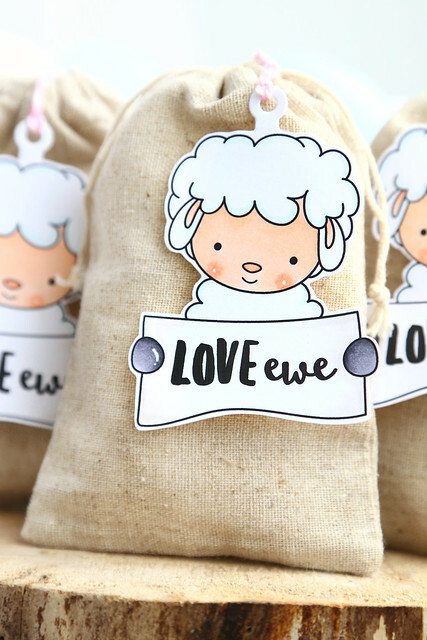 I'm not usually a solid-stamp-loving kind of girl, but this set is the cutest. And, by adding a little bit of shading to the images, they look kind of like no-line-copic-colored images. I really love them! I created a custom sentiment using Milo's ABCs, and heat embossed it in white. 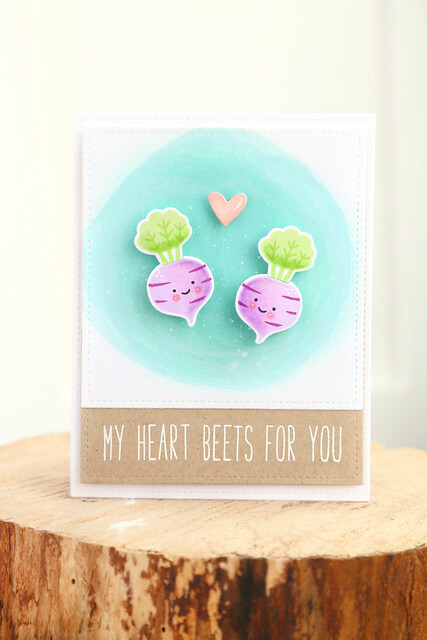 Behind the beets, I used lawn fawn's mermaid ink to spread a wonky circle of ink. The key is to lay your ink layers down very softly, the sponge barely kissing the paper. Then, the layer is nice and even and not splotchy. I then flicked some white ink onto that layer before adding my little beets and their heart. I used a few sets to create these packages: the critters from Party Animal got dressed up as well as the little chick from Chirpy Chirp Chirp! I love that the bunny hat is one-size-fits-all. I then gave them each an egg to hold, from Happy Easter. The sentiment is from Hello Baby. To create the dressed-up fox, I first stamped the bunny hat, masked it, and then stamped the fox (but I wiped off the ink from his tail.) I then masked the fox's body and stamped the little bunny tail in place of his regular, foxy tail. Same deal with the bear. I then cut them both out with scissors and popped them onto the Tote Bag. 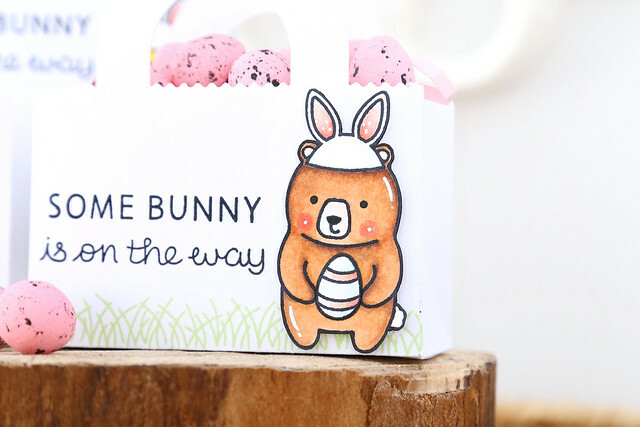 Since the outside of the Tote Bag is plain white, I used pastel-colored cardstock to create filler for the treats. I think it's a fun touch! I hope you like what I've made today! There's more to see on the Lawn Fawn blog today - click! 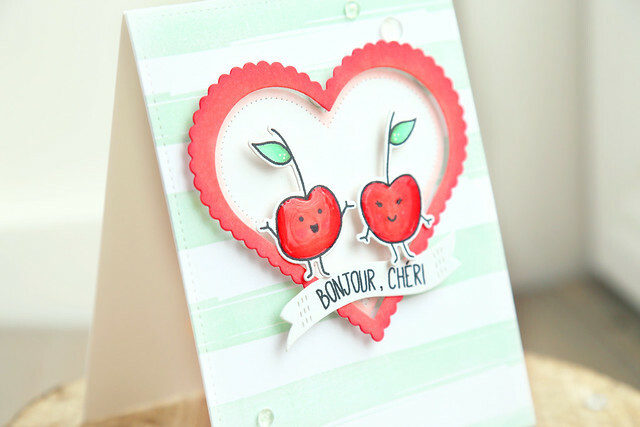 I have a sweet little Avery Elle card to share with you today, using their Mon Cheri stamp set. 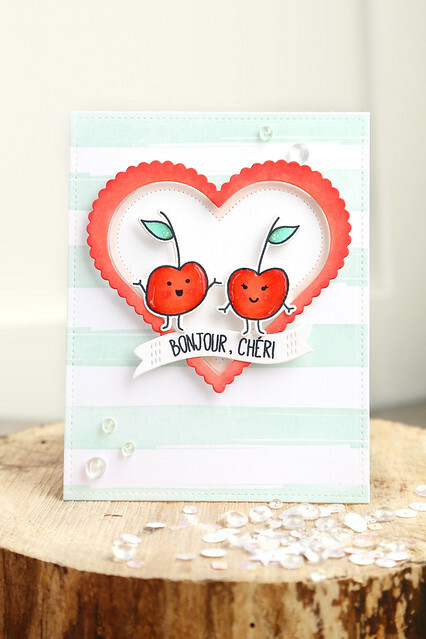 I stamped, colored and die-cut the little cherries, and popped them up over a heart background. I used the scalloped and pierced hearts die set for that, coloring the scalloped heart with the same copics as the cherries. Matchy-matchy. When stamping the sentiment, I cut out the "mon" in between "bonjour" and "chéri" - because it didn't fit on my banner, and because that's still acceptable french. promise. They all sit over a stamped striped background, using AE's Brushed set. My Sweet Petunia/Neat and Tangled week winner! 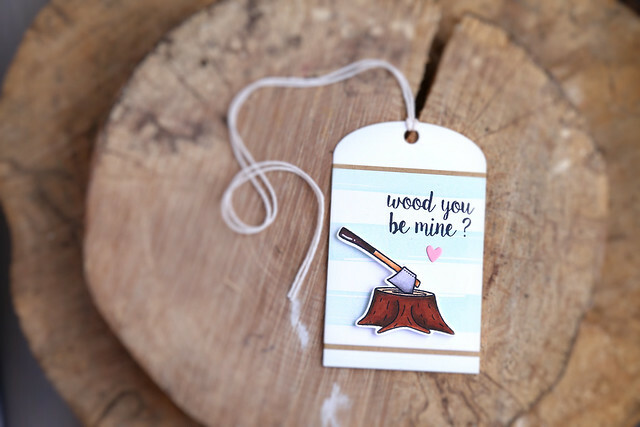 Sorry I'm running late with the winner of last week's Lumberjack Love giveaway. Yuki! Email me with your specifics and we'll get the set mailed out to you. Congrats! Also, the winner of the MISTI giveaway was announced on the NT blog this morning - click! I showed off the colored axe and stump on my instagram feed last week, and I whipped up a quick tag with what I already had on-hand. 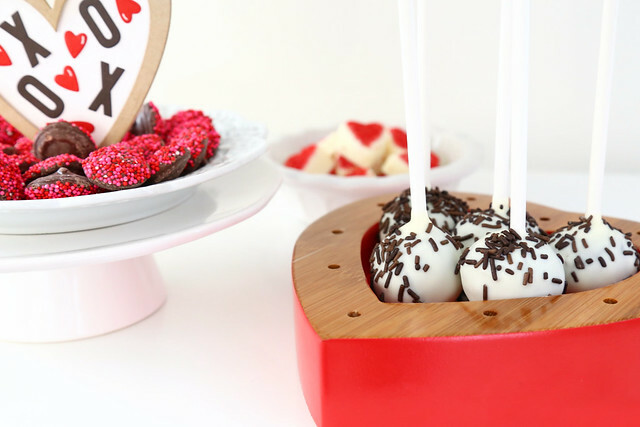 Perfect to slap onto the hubby's valentine's day gift next weekend! 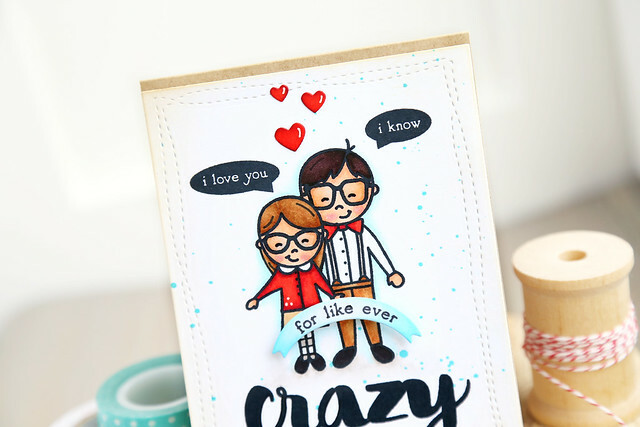 I have a cute little love-note-of-a-card to share today, using Avery Elle stamps and dies. I just love this adorkable couple. Aren't they so quirky cute? My friend JJ illustrated them and I thought they were perfect for this card. I stamped the girl, masked her, and stamped her man in behind. Forget behind every great man, yada yada yada - she is front and centre. 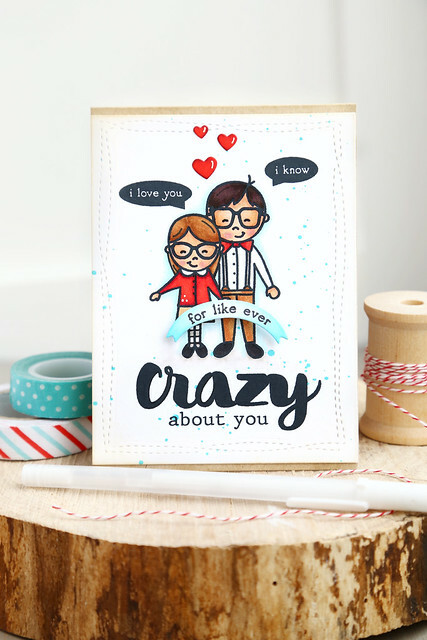 Underneath, I stamped out the "crazy about you" sentiment. I love how large-scale the word CRAZY is. It grounds the couple so nicely! The card wouldn't have worked half as well without that huge, thick font. The "i love you" and "i know" speech bubbles make me giggle. so cute. I used the wonky stitches rectangle dies to give some interest to the otherwise flat panel, and flicked on some blue ink for a final touch. 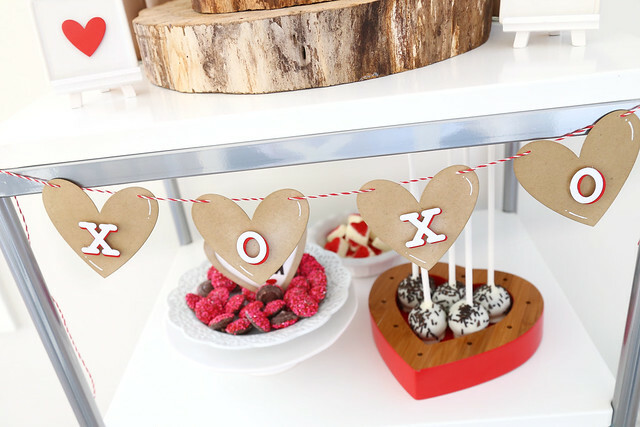 XOXO, easy valentine's day decor! 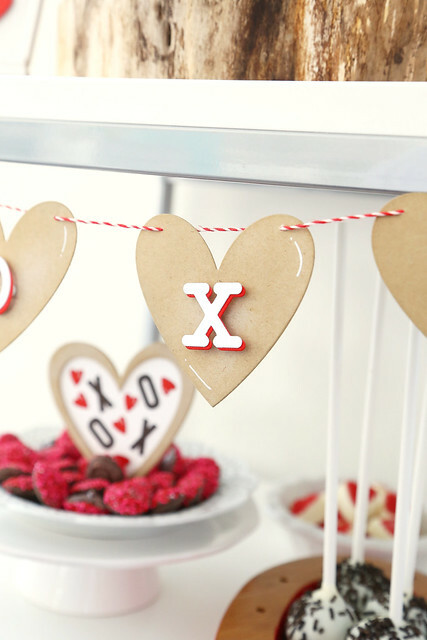 I created some simple Valentine's day decorations using only Lawn Fawn dies. To start, I'll show you the only thing I freehanded. 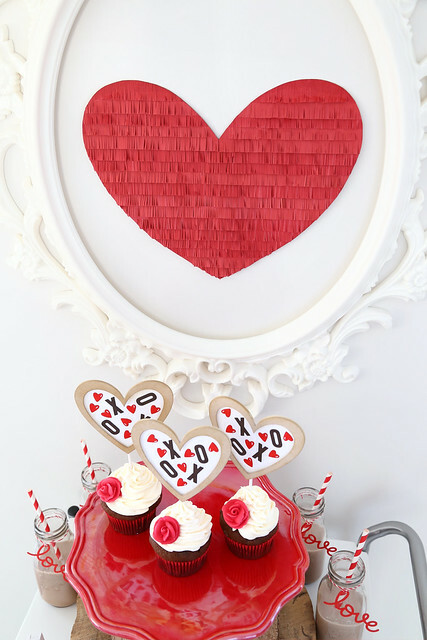 I cut a heart out of a 12x12 sheet of cardstock and then fringed strips of red cardstock to cover the entire front. I really like the look of it. I made something like this a few years ago, but much bigger, for my niece's 1st birthday party (click *here* to see!) I'm still kicking myself for not moving that huge heart into the new house! 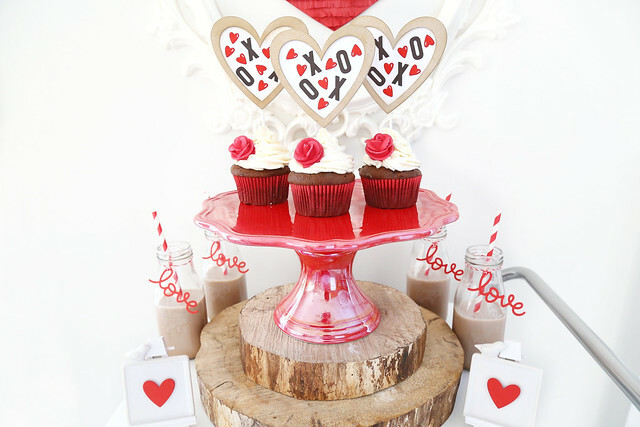 The cupcake toppers were created using Heart Stackables dies, Cole's ABCs dies and little hearts that I added white gel pen accents to. The kraft heart frames are popped up a little, even though it's not visible in these photos. 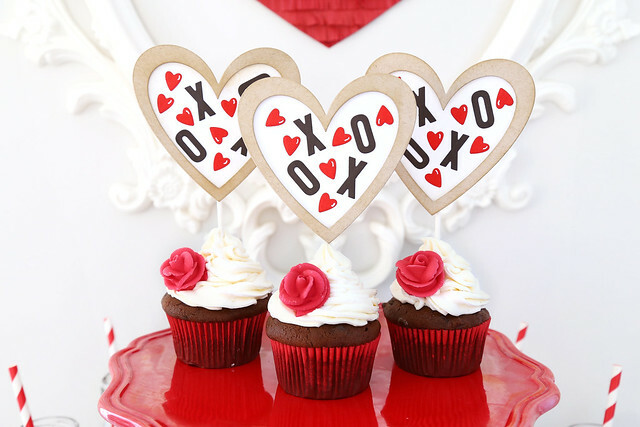 Wouldn't it be fun to make these into shaker hearts? If I had the fuse tool, so that all the sequins wouldn't fall to the bottom, I would totally have gone that route. 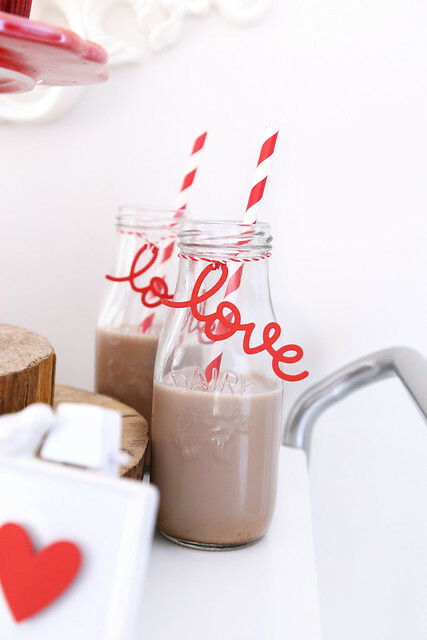 The simplest diy ever, but how cute are these drink bottle tags? I simply cut Scripty Love out of red cardstock and attached it with twine around the bottle-necks. My favorite part has to be this heart banner, with the shadowed letters. I layered Louie's ABCs letters in red and white. A few white gel pen accents to the hearts are a fun touch. 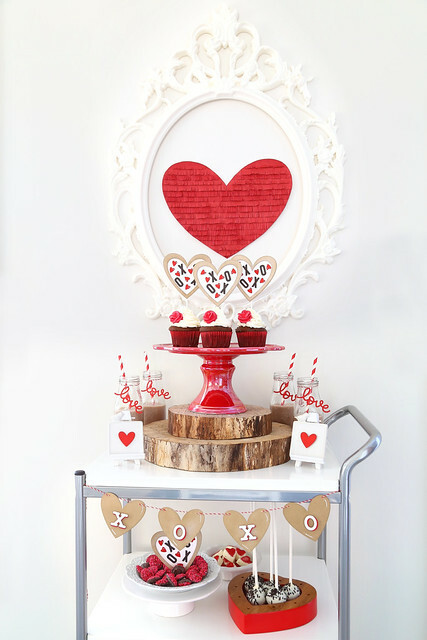 I hope you get inspired to create some simple Valentine's decor for your own home! Thanks for stopping by. The MISTI makes stamping foolproof. Like, no more wasted paper. That is huge for me, a shaky-hands-half-inked kind of stamper. Seriously, the process is always a lot longer for me than you'd think. If I want to line things up just so, the MISTI saves me every time. 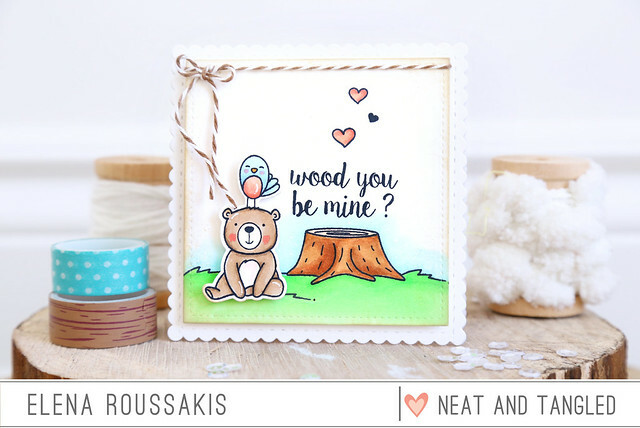 For my card today, I grabbed Lumberjack Love, and used the MISTI to stamp the tree stump, the sentiment, and the trio of hearts in one take. Then, I used it again to stamp the bird above the bear and I die cut them together. I hope you like my sweet little card! Visit the My Sweet Petunia blog for another project, and a chance to win a 100$ gift certificate to the Neat and Tangled Store! ETA: I'm also doing my own little giveaway on the blog! Leave me a comment for the chance to win a copy of Lumberjack Love. I'll pick a winner by Friday!